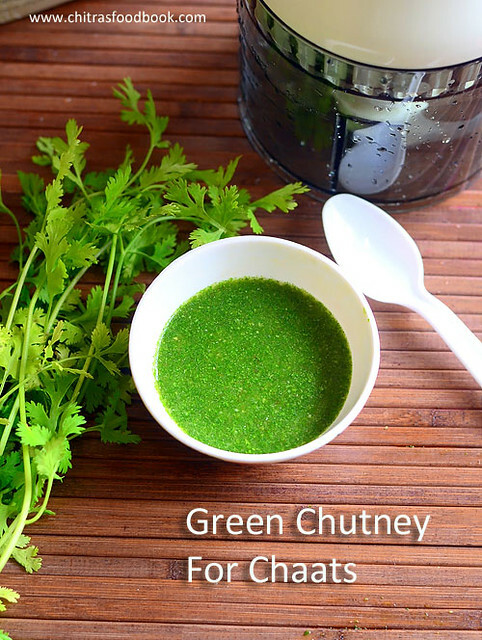 Green chutney recipe can be prepared in many ways based on the requirement. Today I have shown how to make green chutney for chaats with simple ingredients. I prepared this chutney using Preethi turbo chop I received recently for a review. 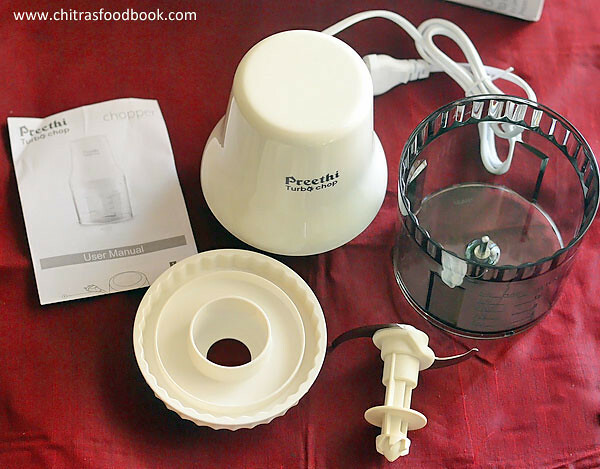 When I got a request to review this product, I accepted it happily as Preethi is one of my favorite brands for kitchen appliances. 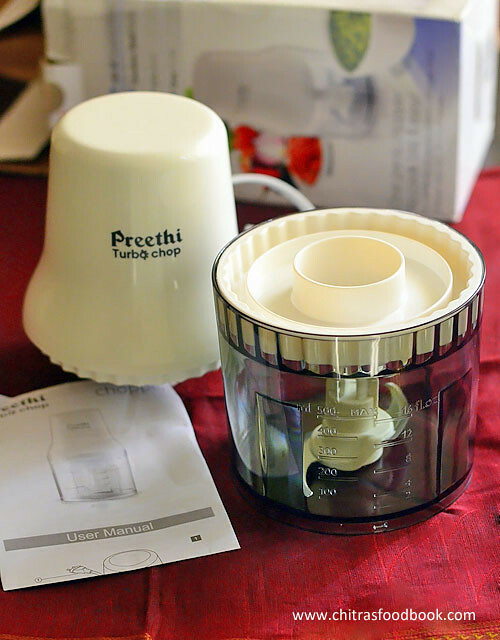 I have been using Preethi products for more than 10 years and it would be my first choice for mixer grinders. 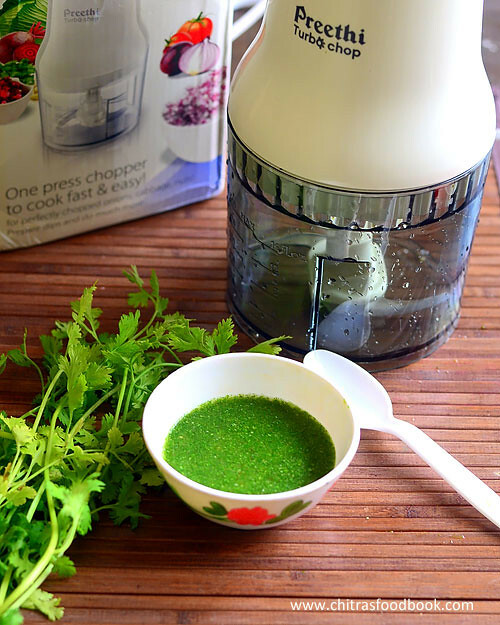 Preethi Turbo Chop is a handy, electric vegetable chopper that perfectly chops the vegetables very finely in no time. It has a 450W powerful motor and sharp blade. So it takes less than a minute to chop onion, tomato and other veggies finely. 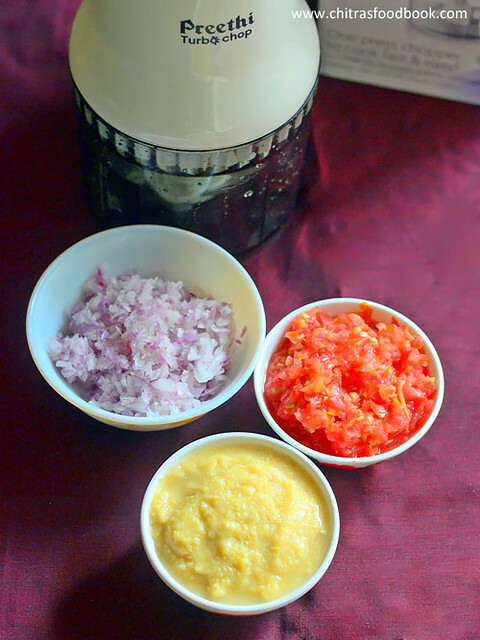 It also helps to grind chutneys, dips, sauce and puree tomato, onion and coconut masala for gravies. Its an ideal gadget for Indian cooking. Basically Indian cooking needs lots of chopping works. This useful gadget makes our job much easier. Chopping gets done in one touch operation which saves lot of time. Working women, bachelors and people who wants to spend less time in chopping during busy morning hours would find this gadget very helpful. Price is also reasonable. As I already have Philips Chopper and blender, I could easily compare both the products. Preethi turbo chop is easy and fast to use than other brands. You can find this product in PREETHI KITCHEN APPLIANCES WEBSITE, WITH A DISCOUNTED RATE AT AMAZON & FLIPKART. Preethi turbo chop looks small & handy. So it occupies less space in kitchen counter. Chops the vegetables very finely in less than a minute. Chops the nuts & dry fruits too. It works really great if you want to grind masala to a coarse paste. You should do it only in batches if you are chopping in large quantity. For smooth paste, it takes more than a minute to grind. At that time, the motor body gets heated slightly. It would have been better if the product has a wiper/whipping blade for whipping curd & milkshakes. In the picture below, you can find finely chopped onion, tomato and boiled kabuli chana paste for making chana masala. Wash & Chop coriander leaves & mint leaves roughly. In the Preethi turbo chop, take all the ingredients given above. Grind to a smooth paste adding required water. You should wipe the sides and grind at regular intervals to make a smooth paste. Remove in a bowl. Dilute with little water while making chats. Store and refrigerate in a clean bottle. It stays good for a week in refrigerator. Cover with the lid and grind it without adding water. Wipe the sides, add required water and grind till smooth. Wipe the sides again and grind if needed. After the chutney becomes smooth, transfer to a bowl. Store in a box , refrigerate and use clean spoon every time. You can dilute the chutney adding little water while adding in chaats. Stays good for a week to 10 days in refrigerator.Enjoy ! Try this easy, yummy Chaat chutney at home and use it for making bhel puri, papdi chaat, pani puri etc.